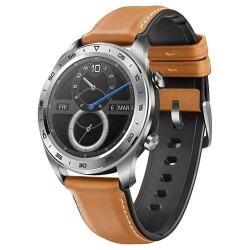 The smartwatch is slim with 9.8mm thickness. 1.2 Inch AMOLED high-resolution display, makes the displayed content more vivid and beautiful. Bigger screen, fit the width of the wrist, bring a pleasant feeling of wearing. Huawei Honor Magic Smart Watch has built-in multifunction NFC, supports Huawei Pay, AliPay and bus cards with NFC payment as well. It bears 5ATM rating meaning that one can go for a swim with it, equipped with GPS as well. It is equipped with TruSleep 2.0, which can monitor a user&apos;s sleep in eight different patterns along with six types of sleep disorders along with up to 200 types of sleep suggestions. It can track activities such as walking, running, cycling, swimming, mountaineering, and more. HUAWEI TruSeen 3.0 heart rate monitoring technology provides a more efficient and accurate real-time personal measurement of your heart rate. Also monitors heart rate 24/7 and give real-time feedback to the users. It&apos;s not easy to increase the length of life on a smart watch with a rich feature set and AMOLED colorful display. Equipped with a 178mAh battery, it can last for a week.